Homeschooling can challenge the scheduling skills of even the most organized moms. How can you keep different ages and abilities scheduled with academic work, field trips, extracurricular activities, and the usual other appointments that life requires? 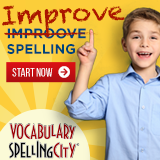 The best way to optimize homeschool organization is by having a vision that it can be done and by working with your own personality. If you are a person who abhors schedules, don’t try to implement something that will detail your life down to five minute intervals. If you cannot stand to do without your schedules and lists, then a mobile device is more likely to suit you than winging it. There are many different ways to organize your homeschool, ranging from different piles on the kitchen table to expensive and elaborate software. Find the one that makes you feel most at ease while allowing you to maintain a comfortable level of control over your home and your school. If you are overwhelmed, take a few moments to do some reading and let yourself rediscover the notion that it is possible to feel more in control of your life and your schedule. 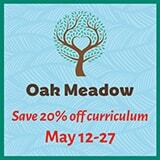 Maybe you have your homeschool under control but your house is beginning to take on a life of its own. Or maybe you are the opposite and your house is spotless but you can’t seem to get on top of the lesson plans for your school. Wherever you find yourself, browse through these articles and websites, letting them inspire you and motivate you to take a step forward in taking back control. An entire website devoted to helping you to keep your house neat and clean in as little time as possible. With sayings like “Even housework done poorly blesses your family”, the Flylady will soon have you Finally Loving Yourself, too. There are numerous tools for organizing your homeschool paperwork and schedule including software and printable paper organizers. Find some of the best ones in this list. Because homeschooling means more time at home than if parents are working and kids are in school, home organization is a crucial part of homeschool organization. 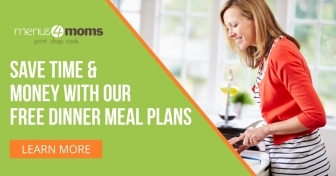 Our sister site, Menus4Moms, can help you put dinner on the table with less stress and more savings. 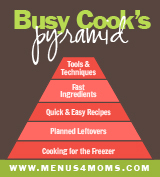 The Secrets of a Busy Cook, seen in pyramid format to the left, are the key to making dinner prep stress-free. At Menus4Moms you will find recipes, tips for saving time and money, bulk/freezer cooking helps, and dinner menus plans.